The cult comedy series Mystery Science Theater 3000 has always welcomed immigrant films with open arms. One can almost imagine a Satellite of Liberty greeting the waves of foreign films seeking a more prosperous life in America. Its inscription might well read, Give me your tired plots, your poor acting, your muddled directors yearning to be schlock-free. It is in this spirit that Volume XXIV presents four of cinema’s transplants from Russia, Italy and two from Japan, that simply didn’t take. Thankfully, Joel, Mike and their band of robot brothers (Tom Servo and Crow T. Robot) alleviate their (and our) suffering by watching these movies with a joyously irreverent stream of higher consciousness. You will have in your hands a collection of passports to laughter. Consider them riffed and stamped by those tormented souls aboard the Satellite of Love. 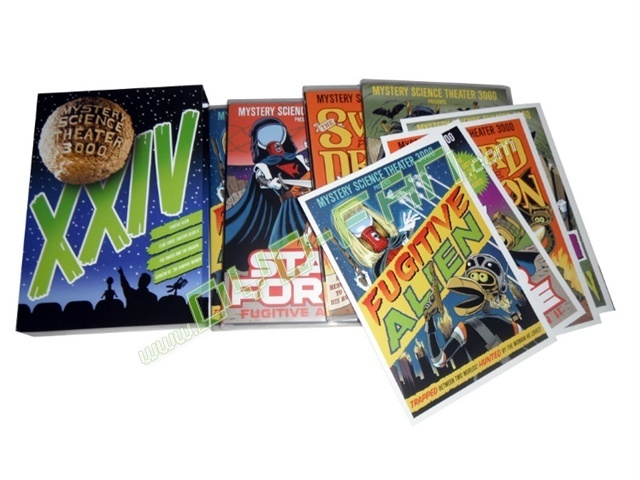 Titles include Fugitive Alien, Star Force: Fugitive Alien II, The Sword And The Dragon & Samson Vs. The Vampire Women.